OAKLAND — The Coliseum had never been a friendly place to Yu Darvish, but A’s hitters are very accommodating right now. 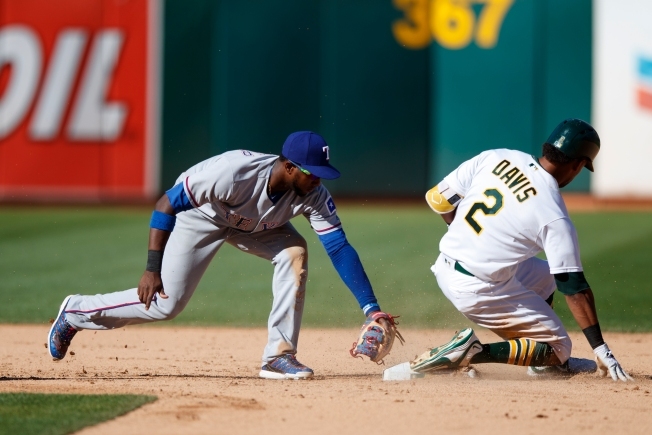 Darvish threw seven strong innings and pocketed his first victory in five career starts in Oakland, as the Rangers extended the A’s offensive woes in a 5-0 victory Saturday afternoon. The A’s were shut out for the second consecutive day, continuing to pose the question of how a team can hit the cover off the ball for an entire road trip and then come home and be so lifeless with the bats. The A’s have been held to eight runs in the first five games of this final homestand, in which they are 0-5. A day after clinching the American League West title, the Rangers got all the offense they needed from Elvis Andrus, who belted a pair of two-run homers off Raul Alcantara (1-2). Oakland has lost each of its last eight home games, with just one remaining before a season-closing seven-game road trip begins Monday in Anaheim. Take away two pitches to Andrus, and Alcantara’s outing wasn’t too shabby. He went six innings and scattered seven hits with six strikeouts and a walk. After Jared Hoying doubled with one out in the second, Andrus launched a 2-2 pitch over the wall in center for a 2-0 Rangers lead. That was still the score in the sixth, when Alcantara got ahead 0-1 before Andrus turned on an inside changeup and drilled another two-run homer that landed just inside the left field foul pole. The Rangers tacked on an insurance run in the ninth off Liam Hendriks. Like Cole Hamels the night before, Darvish (6-5) hardly entered the game pitching his best of late. He’d posted a 6.04 ERA over his previous five starts, and facing Oakland has never brought out his best. Darvish came in 2-9 with a 5.07 ERA in 13 career starts against the A’s. But like Hamels on Friday, Darvish found his stride. He held the A’s to just two hits over his seven innings, striking out nine and walking just one. The A’s advanced just two runners as far as third base. The A’s ended the top of the fifth with a double play as Jurickson Profar tried to tag up on Nomar Mazara’s fly ball to left. Marcus Semien relayed to second and Profar was called out, as it appeared he slid into Joey Wendle’s foot in front of the bag and might have come off the bag as Wendle tagged him. Whatever the case, Profar was irate and, intentionally or not, took a swipe in Wendle’s direction with his arm. Rangers coaches, and even on-deck hitter Joey Gallo, began trotting out toward second in case they needed to diffuse the situation. A crowd of 16,736 was on hand. Jharel Cotton (1-0, 1.50) takes the hill and opposes Colby Lewis (6-3, 3.40) in the A’s final home game of the season Sunday. First pitch is 1:05 p.m.